A few of the most frequently asked questions that we receive are the following; “What connectors do you support out of the box (OOTB)?” and “How hard is it to create a connector?”. In order to answer both these questions, the first thing that needs to be understood is “What is a connector?”. Connectors come in two main flavors for Identity Director. The first type is a Data Import Connector and the second type is an Automation Connector. The difference is where and how they are used which is explain in the next couple of sections. A Data Import Connector is a connector that is used in Identity Director to populate the data warehouse. As of the 2018.3 release, Identity Director supports Active Directory, CSV files, ODBC connections to databases and Microsoft Azure AD. While this looks limited at first glance, CSV and ODBC covers most solutions and only requires a view into the database/dataset and then the fields can be mapped visually. In addition, this set of connectors cannot be expanded outside of Ivanti development. Automation Connectors are the most common type of connector that needs to be modified or written. This type of connector is available in Ivanti Automation and not in Identity Director. This is the connector that actually “talks” to other products to read and write information. Unlike most Identity Governance Administration (IGA) products, Identity Director comes with an Automation engine that allows connectors to be written in whatever language you are most comfortable with and does not force you into a specific language (like JAVA) or use something proprietary. Ivanti Automation comes with connectors OOTB and others that are posted on Ivanti Marketplace. Most of these connectors are foundational, meaning that they are used to create other more complex connectors. 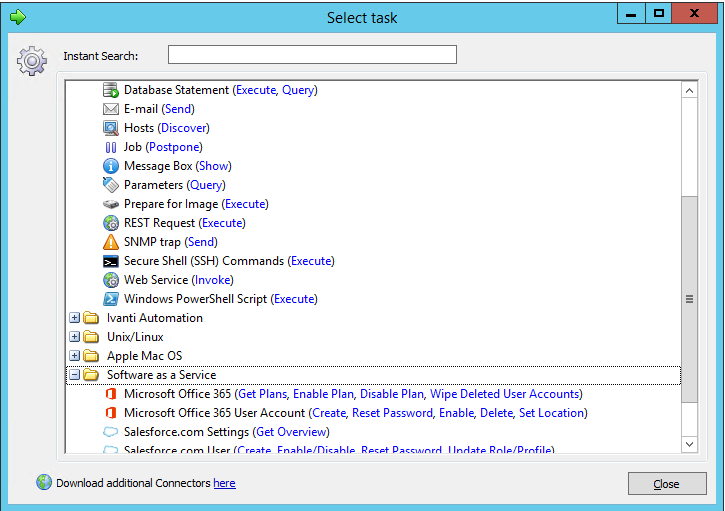 Examples of the OOTB connectors that are foundational are PowerShell, SOAP, REST and SQL. Examples of connectors which are not foundational are Active Directory, Exchange, Office 365 and Salesforce.com. These connectors come both as “pre-packaged” from Ivanti which cannot be changed but can be viewed. The other type of Automation connector is a “community” connector which can be viewed and changed. Both are available on Ivanti’s Marketplace as well as from partners and customers. Hopefully this provides a little more clarity to what a connector means for Ivanti Identity Director. In the following weeks, we will examine how to create a connector with a simple example. Until that time, feel free to contact McGlaun Consulting for more information or head over to the Ivanti Community which has additional resources. Dave Bryant is the VP of Technology at McGlaun Consulting. Newer PostAre You Following These 5 Best Practices to Ensure You Are Managing VDI Correctly? Older PostAre Biometrics the Weak Link in MFA?